It is truly said that the only language that does not change is a dead language. Náhuatl, the language spoken by the Aztecs and their neighbours, is not a dead language. It is spoken by a million or so people in Mexico today, and there is at least as much Classical Náhuatl committed to writing as Classical Greek. Náhuatl is pronounced differently in different regions, just as English is spoken very differently in London, New York, and Calcutta. And like Shakespeare’s English, Classical Náhuatl of the sixteenth century is different from the spoken language of today. The writing system devised for Náhuatl by Franciscan friars in the years immediately following the Spanish Conquest uses too many letters in some cases and not enough in others. 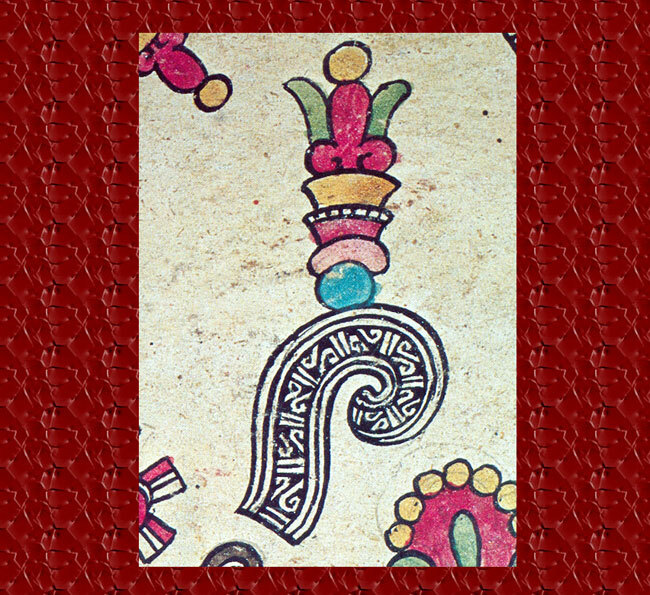 As a result, Classical Náhuatl could be said to be written in a code to remind people of pronunciation rather than to accurately represent it. 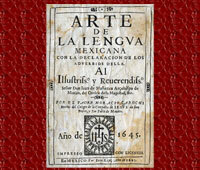 This served the Spaniards and the Náhuatl speakers equally well; the traditional orthography [way of writing it] did not indicate sounds that Spanish speakers couldn’t hear well, while speakers of Classical Náhuatl knew how to pronounce their language even if it was not precisely written. Only we, centuries removed from the days of the Conquest, are at a disadvantage. 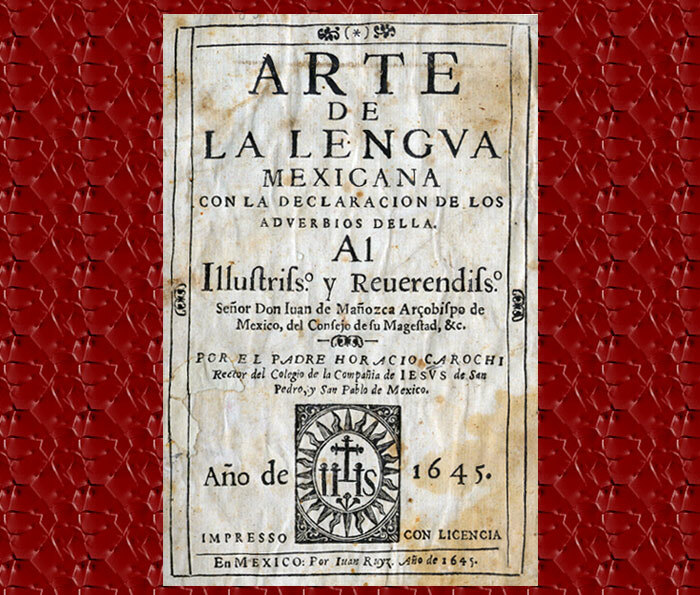 Fortunately, the Jesuits who came to the study of Náhuatl later were trained in music and in languages different from Latin, Spanish, and Italian. As a result, they brought keen ears to their mastery of Náhuatl. 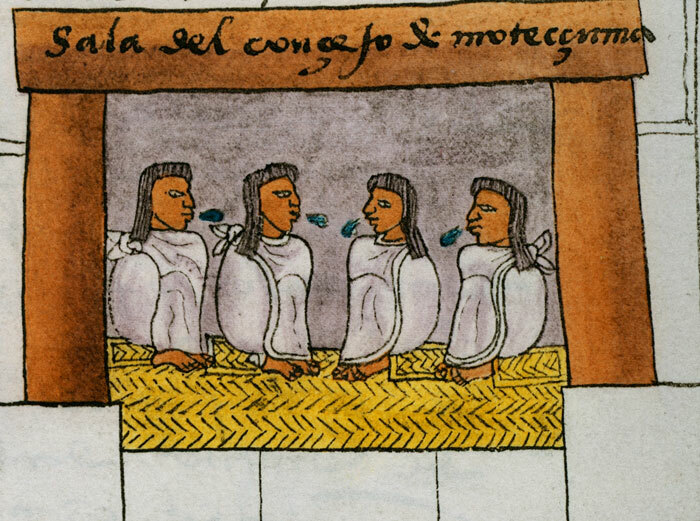 In particular, Father Horacio Carochi came to understand and describe the systematic phonology [sound system and structure] of Náhuatl as spoken by the immediate descendants of the survivors of the conquest. 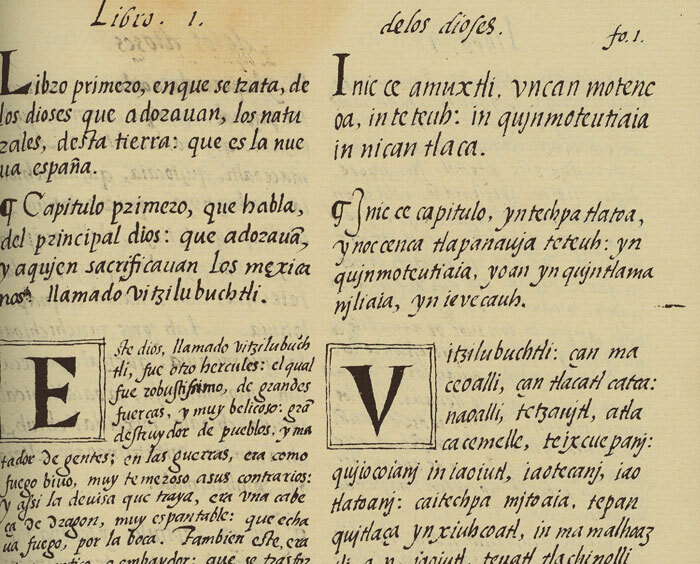 It was Carochi, writing in 1645, who devised a system of diacritics [accents and marks] to indicate two crucial elements of Náhuatl. First, he recognized the glottal stop ( saltillo in Spanish) as a consonant like any other. The earlier attempts to write it down rarely indicated the saltillo. 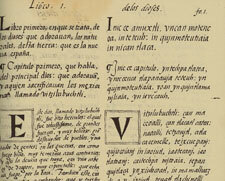 Second, building on a list of contrasting pairs of words devised by one of his Jesuit colleagues, Carochi showed that Náhuatl has two degrees of vowel length. Long vowels contrast with short vowels just as they do, for instance, in Finnish and in Czech. Carochi was the first to say that the only true authority on the pronunciation of Náhuatl was a native speaker of the language. Moreover, he was sceptical that any non-native speaker of Náhuatl could ever completely master the subtleties of the language. When in doubt, he recommended, one must turn to a Nahua. 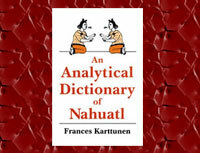 For us today there are three avenues back to the pronunciation of Classical Náhuatl. 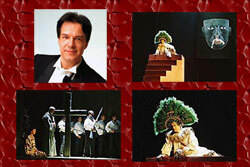 There is the body of work written with accents and marks by Carochi and his associates. 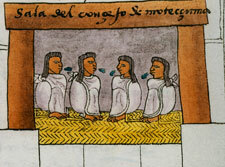 Second, some of the varieties of Náhuatl spoken today are thought to be especially conservative. Because they have changed less, we can follow Carochi’s advice and go directly to their speakers. Third, languages that have diverged much more from older Náhuatl have done so in systematic ways, so by a sort of triangulation among them we can reconstruct the Classical forms. For instance, in the town of Tetelcingo, Morelos, the long vowels have changed in quality, while the short ones have not. This makes it easy to distinguish long vowels from short ones. In other varieties of spoken Náhuatl, in the place of the Aztecs’ saltillo, there is a whispery but audible “h” sound. 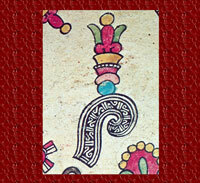 Through comparing material from several modern dictionaries with the writings of Carochi and his school, I compiled the ‘canonical’ forms [those that follow the most basic rules] of the entries in my Analytical Dictionary of Náhuatl, and it was this dictionary that brought me to the attention of Professor Lorenzo Ferrero, and his recently written opera La Conquista. I have been particularly pleased that Lorenzo sought to compose music to fit the sounds and speech melodies of Náhuatl rather than stretching and squeezing Náhuatl to fit his music. In addition to authentic pronunciation, this opera seeks to convey an aspect of Náhuatl rhetoric that is impossible to translate. There was a convoluted style of speaking known as ‘lordly speech’ in which everything is indirect and often contrary to fact. Politeness among the Aztecs required that one often say the opposite of what one meant and to speak at length in florid ways. In classical Náhuatl, anything worth saying once was worth saying twice, and anything said twice was better said four times. Experienced practitioners of lordly speech saw through the verbiage to the intent [read between the lines to get at the real meaning]. A literal translation of Moteuczoma’s welcoming speech to Cortés should not be taken at face value. Doña Marina was valuable to Cortés because, being herself a master of lordly speech, she could deploy it or withhold it for effect. 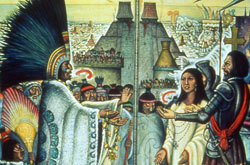 A stunning moment in the first encounter between Moteuczoma and Cortés comes when doña Marina, replying to the great Aztec lord on behalf of Cortés, speaks in a language devoid of all the ornaments of reverential speech. Her direct words to Moteuczoma would have been like the thrust of an obsidian knife blade hidden within a velvet glove. I always come back to re-reading this article. I think it’s the best way to describe it. I always have problems explaining it to people. "There is a whispery but audible ‘h’ sound" - is this the best way to describe that sound? Mexicolore replies: Of course it’s hard to do justice to this sort of thing in a handful of words, but we think this description gives a good idea of the effect: how do others feel?